A 22-year-old man has died after crashing into an oncoming car while 'couch-surfing' along a country road. François Hallé was riding on the sofa, which had been placed on top of a sled and tied to the back of a van, when the driver lost control and forced him into the opposite lane. A 21-year-old man has been accused of dangerous driving, causing death, fleeing the scene of an accident and criminal negligence causing death. Alex Labbé was formally arraigned in court in Saint-Joseph-de-Beauce, Quebec, on Monday. Labbé was allegedly driving the van along a road in Saint-Benjamin, south of Quebec City, when the couch he was towing swerved into oncoming traffic, it was reported on CBC News. Hallé, who died later in hospital, is believed to be the first person to be killed in the craze. Police said Labbé was arrested at his home in Saint-Georges after apparently fleeing the scene. Yan Laflamme, a friend of both men, told CBC News that Labbé panicked when he saw the body of his friend on the ground. 'It's not like he fled because he didn't want people to know it was him,' Laflamme added. 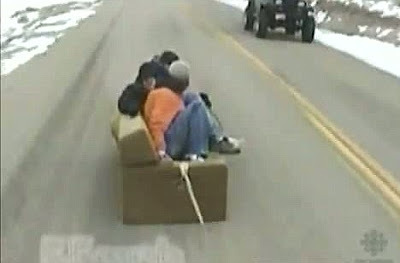 The stunt, known as 'couch-surfing', is popular online with more and more people posting videos showing them being dragged behind a vehicle at high speeds. Laflamme and his friends took up the dangerous hobby after viewing it on the internet.